Today it is increasingly common to see a mobility scooter being used by people of all ages and abilities. 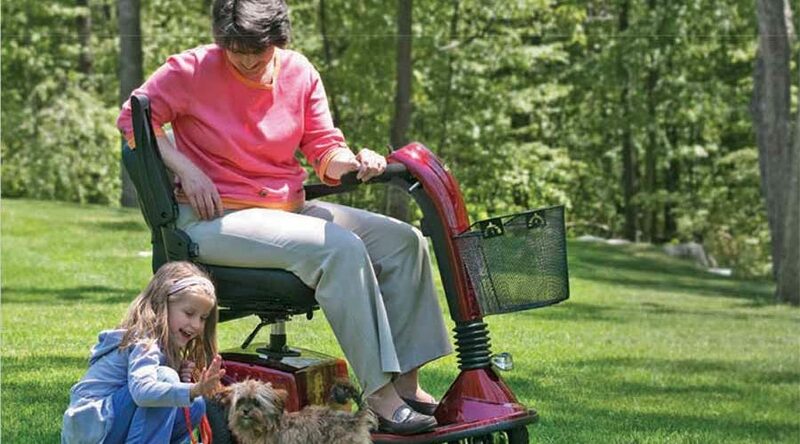 If like so many people you can no longer enjoy daily activities like shopping, visiting friends, or even walking the dog without assistance, then a mobility scooter could be the lifeline you have been looking for to regain your independence. They are easy to use, economical to run and require low-level maintenance to look after them, but can make a world of difference to the user. And a range of available accessories can accommodate nearly any level of ability. If you can sit upright for long periods of time and have the dexterity and strength in both hands to safely steer and operate the controls, you are most likely a good candidate for a powered mobility scooter. However, existing medical conditions must always be taken into account, in particular issues with medications, sight, hearing, blackouts, knees and hips can all be critical in establishing whether it is safe for you to use a scooter. If you have limited hand strength or function, there are design options available to accommodate. If you require additional legroom or back support there are models and accessories to choose from. In general there are several standard things to consider when purchasing any scooter: size, weight capacity, operating range (how far can the scooter travel after charging), indoor or outdoors use, turning radius, and comfortable seating. Smaller scooters allow for easier dismantling and transport and can be used on smooth flat surfaces such as shopping centers. Larger scooters accommodate taller or heavier riders and allow for general outdoor use or for use on uneven terrain, steep hills and longer distances. There are also the items you will be carrying on your scooter to consider – everything from oxygen tanks to laundry baskets and shopping bags. Road warriors that want to explore the neighborhood, explore the park or go on a long distance adventures will definitely need the stability, comfort and battery range of a 4 wheel scooter. However 3 wheel scooters offer additional legroom, which makes them better suited to taller users or for those who cannot keep their knees in a bended position for long periods of time. If you need your scooter to get around the house, the biggest challenge is having enough room to make turns and get down narrow hallways or into bathrooms. Choosing the right scooter may seem overwhelming, but if you focus on your specific needs, you will quickly narrow down the choices. Pace Medical Equipment & Supplies takes all the worry out of purchasing a scooter. We confidently stand behind the products we offer and provide you with the best warranties in the industry. Our experts can give you a free, no obligation consultation. Hop aboard one of Pace’s Golden Technologies’ four lines of scooters, and discover a newfound sense of freedom. Or try a portable scooter from Pace’s Pride Go Go Mobility line. One of our models will give you the right combination of size, weight, portability and accessories. All provide the industry’s highest levels of stability, dependability, performance and comfort. Visit our showroom to test drive the industry’s most comprehensive line of consumer scooters today!